When a resident filming the latest town council meeting refused to move from the front row of the public seating because he is hard of hearing and sometimes needs to lip read, the Mayor threatened to call the police. Watch the video of events unfolding. Last week’s Brading Town Council meeting came to an abrupt halt, when councillors voted in favour of suspending the meeting just minutes after it had begun. Brading resident, Chris Offer, has been attending the Town Council meetings for over eight years and recently discovered he was permitted, by law, to be able to film the meetings as a member of the public. However, last week’s meeting was suspended after Mr Offer refused to move to the press table at the side of the room from the front row of the public seating, where he explained he’d sat for many years due to a difficulty with his hearing. Mr Offer replied that he was not obstructing the view any more than another member of the public, adding, “so please don’t be silly”. Deputy mayor, Cllr Richard Whiting, appeared to take offence to the use of the word ‘silly’ saying, “Er that’s not the right word to use please, silly,” and also asked Mr Offer to move. 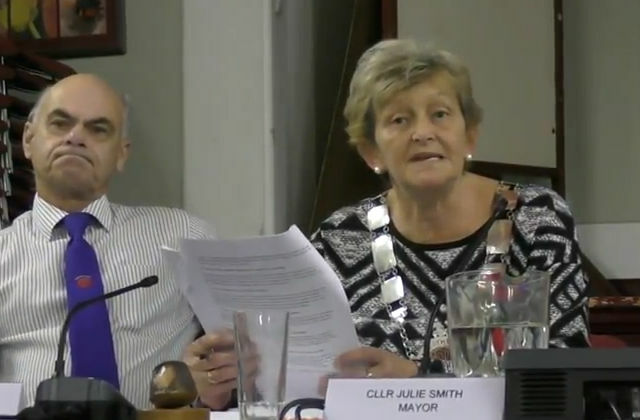 Cllr Whiting went on to ask whether Mr Offer had public liability insurance and suggested he had “no duty of care to the people around him”, adding “I’m sure members of the public would deserve that to be done”. He went on to suggest that if he was in charge he’d cancel the meeting. Then adding under her breath, “very silly”, presumably deemed OK to use in this context, as there was no objection from Cllr Whiting. It’s not clear from the video below where the intimidation was coming from. The council then voted to suspend the meeting, but not before the deputy mayor introduced us to a new word. Mr Offer filmed the incident from his small camcorder that was placed on a mono-rod held in front of his chest. “It is my sincere belief that BTC simply do not want their meetings to be video-recorded and are putting up any number of obstructions and red-herrings to try to prevent it. “A good example being the question from Cllr. Whiting about public liability insurance! BTC seem to have completely missed the point that I am continuing to attend meetings, as I have done for eight years, as a member of the public. “They seem to think that I have somehow been transformed overnight into a representative of the media! The only difference now is that I now bring and use a small domestic camcorder with an auxiliary microphone mounted on top, as I am entirely entitled to do. OnTheWight contacted the mayor and the clerk of Brading town council earlier today, but at time of publishing had not received a response. As always, this will be added later if received. Mr Offer has also shared his recording of the previous month’s meeting, which readers or Brading residents might be interested in. 9 Comments on "Town council threaten to call police during filming of meeting"
Just goes to show how small minded some people can be, Mr Offer was well within his rights to film the meeting and I applaud him for standing his ground and actually taking the time to attend these meetings. How dare those public servants try and stop someone exercising their rights, when is the next meeting? I have a bodycam that will not obscure a thing, maybe everyone should turn up with camera next time! Such a shame that what has always been a friendly Town meeting should have come to this. Why should they (the council) feel “intimidated” having their meeting recorded within the law. It gives others who do not wish to attend meetings a chance to see how their Town is run. And these people are Better ! than those prior having been born in Brading I shall not be broadcasting that fact ashamed to say the least well done Mr Offer. I have a suggestion. Brading Town Council consider undertaking their own recording of all their meetings and post these on their website as a public record. This would avoid any perceived need by residents to record the meetings and a repeat of the unnecessary disruption and disquiet that this seems to have caused. To your first point johnb: To become as accessible as possible Ventnor Town council agreed to audio record their town council meeting close to ten years ago. It looks like their ‘Audio Recording Policy’ was adopted a couple of years later (2010) [PDF]. I’m not sure if they still record the meetings – Will seek to find out. I wonder what Mr Offer got out of his behaviour at the Town Council meeting. It was not as though he was being asked to stop filming. It appears he was being given his own “recording space”. I sincerely hope that he is happy with the outcome of his refusal to move.